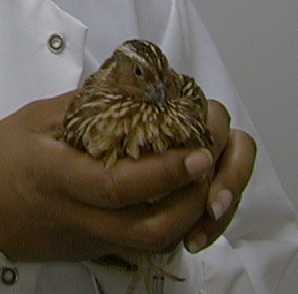 Japanese quail are ideally suited for experiments on sexual motivation and drug taking behavior. The birds readily engage in reproductive behavior in the laboratory by providing them with adequate artificial light. This makes it convenient to alter their reproductive status by changing the light cycle. Their courtship and sexual responses are distinctive and easily identifiable and much is already known about the hormonal system and dopamine neural circuitry in this species. Japanese quail also have a well-developed visual system with color vision. The use of a visually-oriented species in this approach has important functional and clinical relevance for drug abuse. Since humans depend on visual sensory information, an animal model of human drug dependence that incorporates a visually-oriented animal may be of additional relevance to studying human drug addiction. A number of clinical studies have shown that stimuli that become associated with previous drug-taking behavior may come to elicit conditioned physiological and subjective responses, that ultimately may trigger drug relapse. Finally, quail provide a convenient and interesting alternative to standard laboratory rats and pigeons.